Whilst birding the spray fields on 15th April I saw an unusual Turkestan Shrike that had a typical Turkestan Shrike look but had a ‘grey’ mantle and crown colour, rather than the browner colour of classic Turkestan Shrikes. This bird fitted well with what I expected for a 'karelini' type bird but lacked the white at the base of the primaries I was expecting and had a darker tail that I thought was atypical. I was also concerned by the rufous wash to the flanks and although it appeared to be clean white below was not entirely so. This prompted me to look into 'karelini' in more detail and I found out the following that I though was worth sharing, most of which has come from Brian Small and particularly Alan Dean on Surfbirds - this is an excellent forum for gaining an insight from more knowledgeable and experienced birders on difficult subjects such as this and I am very thankful to them, and others, for taking the time to share their undoubted knowledge. 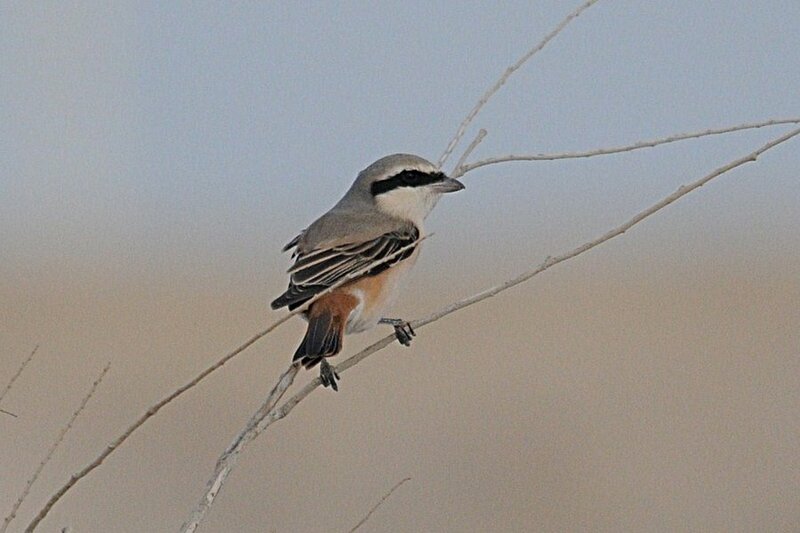 The opinion on this bird is that it is a hybrid type Turkestan Shrike and Red-backed Shrike (or other species), as it does not fit a classic 'karelini' as its tail is to dark, the crown & mantle colour are not pale grey enough (it should be like a 'grey shrike' in colour) and the underparts are not clean white enough. This was the feeling I had when I saw the bird but it is great to have it clarified by others. The karelini type shrikes are a type that is only well understood by a few expert birders and the situation is not clear to the majority of us. There are some thoughts that karelini may be a colour morph of Turkestan Shrike whilst others think it is a hybrid of Turkestan Shrike phoenicuroides and Red-backed Shrike collurio (Panov, Sandgrouse 31, 2009). Birds labelled karelini go back to an illustration in Bogdanov 1881, and were thought to be a hybrid by him, so dark portions in the outer-tail would not be unusual in 'karelini'. The range of karelini plumages that Panov has identified from skins are generally grey(er) birds, but also they include some more phoenicuroides like birds (at the pale end), but with darker areas in the tail. Classic karelini birds normally have a quite uniformly pale grey crown and pure grey upper-parts resembelling a ‘grey shrike’ with the mantle of such individuals being like neither Red-backed Shrike nor typical Turkestan Shrike, nor is it intermediate between them. Karelini is a shrike with a ‘grey shrike’ hue (in quite fresh plumage) which in combination with clean white under-parts, with perhaps a pink/peach suffusion confined to upper and rear flanks, results is an appearance which is very distinctive, as much so as in any of the other forms. 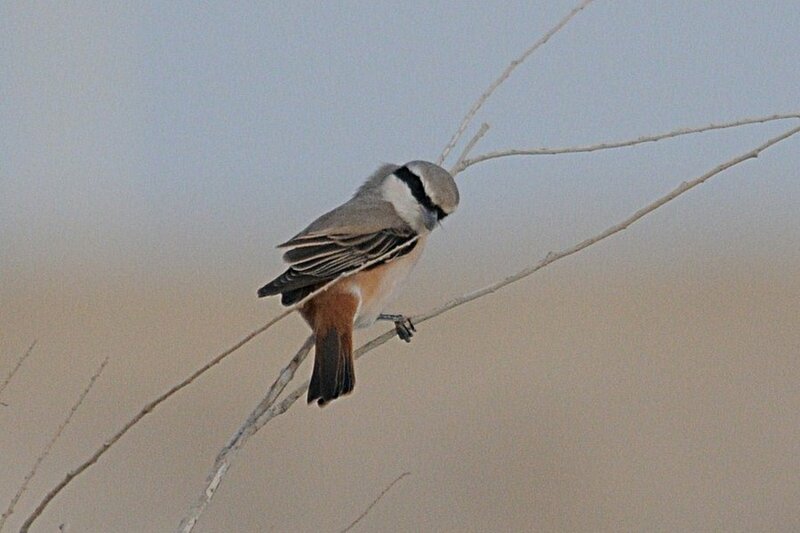 These classic type karelini add credence to the possibility they are colour morphs of Turkestan Shrike and not hybrids. Wear and bleaching of typical Daurian Shrikes also needs to be taken into account if faced with a grey looking karelini type shrike. The problem with this type is that many people appear to assign to karelini any Turkestan Shrike type which lacks a contrastingly rufous crown. Yet many of these individuals are in almost all other respects quite ‘typical’ phoenicuroides, with an evident brown component in the mantle colour any of which may be hybrids such as those identified by Panov? Evegeniy Panov regards karelini as a relatively stable hybrid form (The True Shrikes of the World, published by Pensoft) and includes two series of specimens to back up his argument. 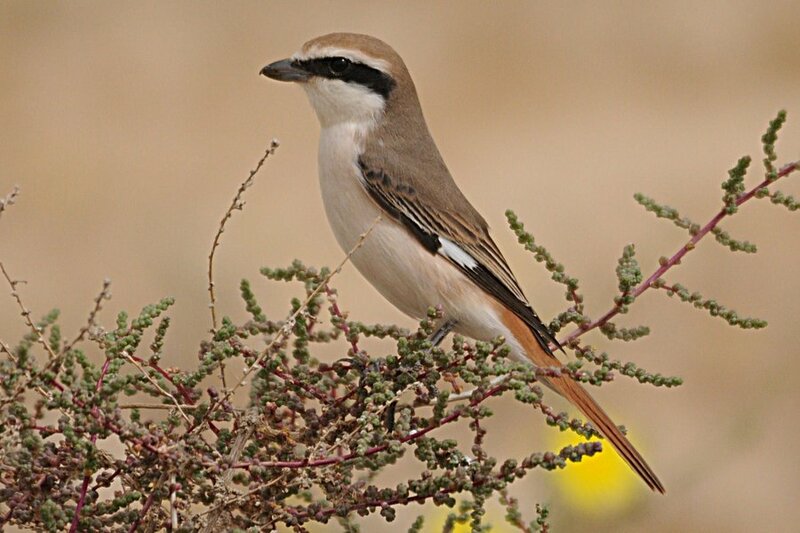 The first series has the first bird as a classic male Red-backed Shrike and the last a classic male Turkestan Shrike with the other eight various hybrid forms including karelini, showing karelini fits into this series of hybrid forms in his opinion. The second series contains 20 specimens which he claims illustrate a gradual transition between specimen 1, a classic male Turkestan Shrike and specimen 20, which he claims is ‘indistinguishable from the type specimen of karelini’. Although there is an increasing greyness to the upper-parts, the key feature appears to be a ‘decreasing rufous tinge to the head’. He also mentions that karelini occurs most frequently (though by no means exclusively) where the ranges of Turkestan Shrike and Red-backed Shrike approach or overlap. Whether karelini is a morph of Turkestan Shrike or a relatively stable hybrid form is certainly a controversial question currently.